The Organization of Islamic Cooperation (OIC) has stated in its report that Gaza Strip has witnessed serious Israeli escalation in October. In its report, the OIC Independent Permanent Human Rights Commission (IPHRC) confirmed that four Palestinians were killed during Israeli airstrikes and incursions in Khan Younis, southern Gaza Strip, in addition to a number of injuries. Israeli military watch towers continued to fire at Palestinian farmers along the border area, the report added. 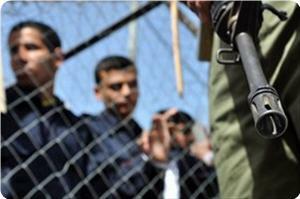 IPHRC's report affirmed that Egyptian authorities closed Rafah crossing for 10 days during October. Only limited number of passengers has been allowed to travel during the fixed opening hours, increasing the number of stranded passengers in Gaza Strip to five thousand people. The report pointed to the power crisis in the besieged Strip, warning of a looming humanitarian crisis. Gaza faces power cuts of 12 hours per day, affecting life services in the Strip mainly education and health services, the report added. OIC stated that there are four thousand fishermen in Gaza Strip suffering very difficult living conditions. Nearly 90% of Palestinian fishermen live at poverty line or below, OIC report said. The organization called for supporting Palestinian fishermen in Gaza Strip through providing them with needed fuel, maintaining their boats, and providing them with fishing tools in light of Israeli continued targeting of them. In its Weekly Report On Israeli Human Rights Violations in the Occupied Palestinian Territories for the week of 07- 13 November 2013, the Palestinian Center for Human Rights (PCHR) found that 2 Palestinian civilians were killed by Israeli forces at military checkpoints in the West Bank. 7 others were wounded this week, including 2 children, in the West Bank and the Gaza Strip. Israeli forces have continued to use excessive force against peaceful protesters in the West Bank. 2 Palestinian children were wounded in Hebron and Ramallah. Dozens of civilians suffered tear gas inhalation. In the West Bank, in an excessive use of force, on 07 November 2013, Israeli forces killed 2 Palestinian civilians at Za'tara checkpoint, south of Nablus, and the Container checkpoint, northeast of Bethlehem, in the West Bank. According to investigations conducted by PCHR, at approximately 18:00 on Thursday, 07 November 2013, Basheer Sami Salem Habnain, 29, from Marka village south of Jenin, was traveling in a taxi from Ramallah to Nablus. When he became 20 meters far from Za'tara intersection, south of Nablus, he stepped down from the taxi and crossed the main road towards the other side. He was carrying a box of fireworks, from which flares were unleashed. Soon, an Israeli soldier descended from a military observation tower and fired directly at Habnain, killing him with 7 bullets to the legs and thighs and an 8th one which entered the back and exited the chest. Israeli forces kept the victim's body until 03:00 on Friday, 08 November 2013, when they handed the body to the Palestinian liaison department. 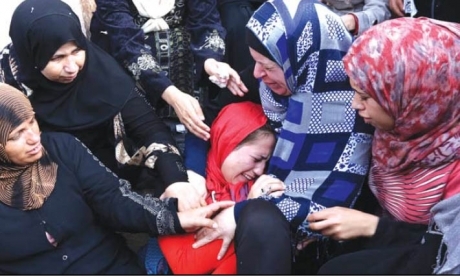 The victim was a lecturer at the fashion department in Palestine Technical University (Kadoorie) in Tulkarm. Israeli forces claimed that "Habnain was carrying a flare gun, from which he fired at soldiers, so the soldiers responded by firing at him, and he was instantly killed." A video clip published on Youtube shows an Israeli soldiers descending from an Israeli military observation tower to the southeast of Za'tara checkpoint, and then firing at the area to the southwest of the checkpoint. Another 2 soldiers are seen in the video clip coming from the checkpoint. Even according to the Israeli narrative, Israeli forces could have used less lethal means against the victims, such as arresting him. In a similar crime, at approximately 21:30, Isma'il Fu'ad Refa'ei al-Atrash, 25, and his brother Anas, 23, arrived at the Container checkpoint, northeast of Bethlehem, traveling from Jericho to their home in Hebron. They were traveling in a civilian car driven by Isma'il. When they arrived at the checkpoint, Isma'il slowed down to cross road bumps. Anas opened the door, and once he stepped down, Israeli soldiers shot him dead with 2 bullets to the chest. 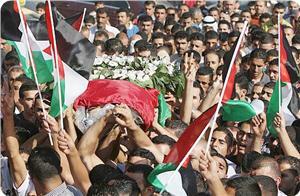 Israeli soldiers took Anas' body and put it in a plastic sac near the checkpoint. Residents of the area and a number of members of the victim's family arrived at the checkpoint and skirmishes erupted between them and Israeli soldiers. Later, the family received Anas' body. Israeli forces claimed that "the young man attempted to stab a soldier, so the latter fired at him directly, killing him." According to Palestinian medical sources, the victim was hit by a bullet to the chest. On 11 November 2013, a Palestinian child was wounded by Israeli forces during a demonstration organized in Nabi Saleh village, northwest of Ramallah, in commemoration of the 9th anniversary of President Yasser. 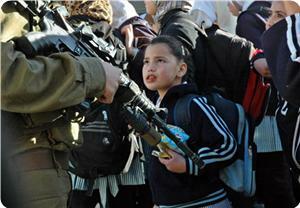 On the same day, a child was also wounded in Hebron. During the last week, Israeli forces conducted 68 incursions into Palestinian communities in the West Bank, abducting at least 46 Palestinians, including 8 children. 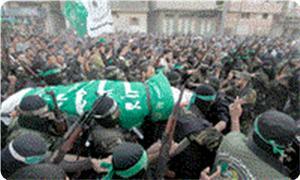 The detainees include a number of political leaders of Hamas. Israeli forces established dozens of checkpoints in the West Bank. At least 10 Palestinian civilians, including 5 children and a woman, were abducted at checkpoints in the West Bank. In the Gaza Strip, on 10 November 2013, a Palestinian fisherman was wounded by Israeli forces in the northern Gaza Strip. On 13 November 2013, 2 Palestinian civilians were wounded by Israeli forces in border areas in the southern and central Gaza Strip. At approximately 10:50 am, Israeli forces positioned at the border between the Gaza Strip and Israel fired at a person in civilian clothes who got as close as to 80 meters from the border to the east of al-Qarara village, northeast of Khan Yunis, wounding him with a bullet to the right leg. Following coordination through the ICRC, medical crew were able to attend him and evacuate him to Nasser Hospital in Khan Yunis. He was identified as Ashraf Fayez Abu Zaher, 23, from Wadi al-Salqa village. In the context of targeting fishermen in the sea, Israeli gunboats stationed in the sea opened fire at Palestinian fishing boats 4 times, during which the abovementioned fisherman was wounded and fishing boat was confiscated. Israeli forces also detained 2 fishermen for one day. In addition, Israel has continued to impose a total closure and has isolated the Gaza Strip from the outside world. On 07 November 2013, a number of Israeli settlers from “Havat Gal” settlement, east of Hebron, set fire to 2 cars belonging to Palestinian civilians in al-Jalajel village, east of Hebron. They also wrote “In solidarity with Beit Ain settlement” on walls of houses in the village. Losses in the 2 cars are estimated at 7,000 NIS (approximately US$ 2,000). On 08 November 2013, dozens of Israeli settlers living in settlement located near Taqqou’ village, southeast of Bethlehem, closed the western entrance of the village, claiming that stones and Molotov cocktails were thrown at a settler’s car. The settlers raised the Israeli flag and organized a march in the area. On 10 November 2013, dozens of Israeli settlers living in settlement located near Taqqou’ village, southeast of Bethlehem, closed the western entrance of the village. The settlers raised the Israeli flag and provoked Palestinian civilians. Later, Israeli forces blocked the road leading to Khirbat al-Deir area in the northwest of the village with sand barriers. Israeli has continued to create Jewish majority in occupied East Jerusalem. 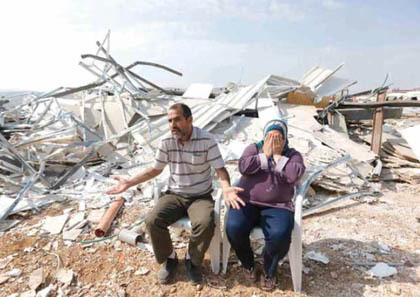 Israeli authorities forced a Palestinian civilian to demolish his house. As a result, dozens of civilians suffered tear gas inhalation, and others sustained bruises. Following the Friday Prayer, 18 November 2013, dozens of Palestinian civilians and international and Israeli human rights defenders organised a peaceful demonstration in Bil’in, west of Ramallah, in protest at the construction of the annexation wall and settlement activities. Demonstrators took the streets raising the Palestinian flags and headed to the liberated territories near the annexation wall. Israeli forces had closed all the entrances of the village since morning to prevent the Palestinian and international activists and journalists from participating in the demonstration. As a result, a number of demonstrators suffered tear gas inhalation and others sustained bruises due to being beaten up by Israeli soldiers. Around the same time, dozens of Palestinian civilians and Israeli and international human rights defenders organised a peaceful demonstration, in protest at the construction of the annexation wall and settlement activities, in Nabi Saleh village, northwest of Ramallah. Demonstrators took the streets raising the Palestinian flags and chanting slogans against the occupation and in support of the Palestinian unity resistance, and then they headed to the lands that the settlers are trying to rob by force near “Halmish” settlement. Israeli forces had closed all the entrances of the village since morning to prevent the Palestinian and international activists and journalists from participating in the demonstration. When they arrived at the land, the demonstrators were met by live bullets, tear gas canisters, rubber-coated steel bullets, sound bombs and skunk water and were chased into the village. As a result, a number of civilians suffered tear gas inhalation and others sustained bruises due to being beaten up by Israeli soldiers. Following the Friday prayer, dozens of Palestinian civilians and international and Israeli human rights defenders organised a peaceful demonstration in Ma’assara village, in protest at the construction of the annexation wall and settlement activities. The demonstration started in front of the Candles Cultural Centre in the centre of the village. Demonstrators moved in the streets raising the Palestinian flag. When they arrived at the area where the annexation wall is established, Israeli forces started firing tear gas canisters in attempt to disperse them and prevented the demonstrators from reaching the annexation wall. A number of civilians suffered tear gas inhalation. At approximately 08:30 on Monday, 11 November 2013, dozens of Palestinian civilians gathered at the entrance of Nabi Saleh village, northwest of Ramallah, to commemorate the 9th anniversary of President Yasser Arafat’s death. They threw stones at an Israeli military observation tower in the area. Immediately, Israeli soldiers fired rubber-coated metal bullets, tear gas canisters and sound bombs at them. As a result, Mohammed Bassem Tamimi, 11, was wounded by a rubber-coated metal bullet to the right side, and other civilians suffered tear gas inhalation. Due to the number and severity of Israeli human rights violations this week, the PCHR made several recommendations to the international community. Among these were a recommendation that he UN General Assembly transfer the Goldstone Report to the UN Security Council in order to refer it to the International Criminal Court in accordance with Article 13(b) of the Rome Statute. The PCHR also calls upon the United Nations to confirm that holding war criminals in the Palestinian-Israeli conflict is a precondition to achieve stability and peace in the regions, and that peace cannot be built on the expense of human rights and victims. Human rights network, based in Oslo, said that the Israeli authorities issued around 22,000 administrative detention orders against Palestinian prisoners since al-Aqsa Intifada on 28 September 2000. UFree Network confirmed that almost 150 Palestinians are held in administrative detention in the jails of Negev, Megiddo, Ramon and Ofer, the organization said. The administrative detention is a detention without charge or trial, based on secret evidence no one is allowed to check, not even the prisoner's lawyer. 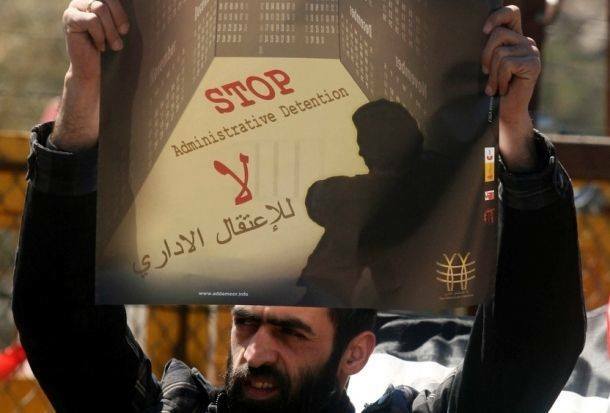 According to Israeli military orders, administrative detention could be renewed more than once for 6 months each time. Meanwhile, Ahrar center for prisoners studies confirmed that the administrative detention of former head of the Students Union in Bir Zeit University Fadi Hamad, 27, a new six months. For his part, Fouad Khuffash, director of the center, stated that the prisoner Fadi Hamad was arrested administratively on May 2013. Khuffash confirmed that Fadi Hamad, a student in Bir Zeit, is a liberated prisoner where he spent many years in Israeli jails. 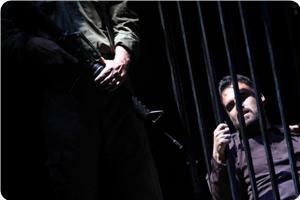 He confirmed that Palestinian liberated prisoners are the main victim of administrative detention. A human rights report said on Tuesday that 95% of Palestinian prisoners in Israeli occupation jails have been subjected to various means of torture. The Palestinian prisoner’s society said that torture in Israeli jails does not spare women or minors and even sick internees, and added that violence against prisoners takes various forms. The society called for internationalizing the issue of prisoners and for backing them at all platforms. Israeli violations have escalated against Jerusalemites during October, including arrests against minors and children, in addition to demolition orders against Palestinian houses and facilities in occupied Jerusalem, Palestinian human rights sources said. In its monthly report, Wadi Hilweh Information Center revealed that Israeli occupation forces (IOF) arrested in October 75 Jerusalemites including 45 children aged 10-17 years, some of them were accused of throwing stones 100 days earlier. The report pointed out that demolition campaigns have noticeably escalated during October against Jerusalemites' houses, facilities, and sheds. Israeli bulldozers demolished a three-story building, which was built 10 years ago. As a result, nine Jerusalemites were displaced. Another building consisting of 3 floors with the first floor having 4 commercial stores was also razed in the neighborhood of Beit Hanina north of Jerusalem under the pretext of building without a permit. Two rooms, in Jabal Mukaber, and four stores in Beit Hanina were also destroyed. Meanwhile, Israeli demolition orders have increased against Palestinian houses and buildings in occupied Jerusalem particularly Shufat refugee camp, Silwan and Beit Hanina, and Sawwanah. Nearly 200 demolition orders were issued against houses and stores accommodating 16 thousand Jerusalemites, the report said. Meanwhile, the Jerusalem municipality court ordered the demolition of part of a building owned by the family of Siam located in the neighborhood of Bi’er Ayoub in Silwan. The building consists of 5 floors and accommodates 25 Jerusalemites mostly children. The report pointed to the escalating Israeli break-ins into al-Aqsa mosque at daily basis, noting that settlers raised the Israeli flag on the day of Arafa. The center's monthly report revealed Israeli scheme to build a synagogue in al-Aqsa Mosque as a prelude to dividing the mosque spatially and temporally. Israeli Ministry of Religious Affairs has submitted a bill allowing Jews to pray in al-Aqsa mosque for the first time since 1967. The Palestinian Center for Human Rights (PCHR) based in Gaza published its weekly report on Israeli violations in the occupied territories, in the period between October 21 and November 6 2013, and said that Israel army killed five Palestinians, and injured dozens of residents. It stated that, on October 31, soldiers killed four members of the Al-Qassam Brigades, the armed wing of the Hamas movement, during clashes that took place as the army invaded Palestinian areas between Al-Qarara and Bani Suhaila village, east of Khan Younis, in the southern part of the Gaza Strip. Three of the slain fighters were in a tunnel that was bombarded by the invading soldiers, and their bodies were buried under the rubble. Also on October 31, soldiers shot and killed a Palestinian civilian in Qabatia village, near the northern West Bank city of Jenin. Furthermore, a Palestinian political prisoner identified as Abdul-Halim Torabi, died on November 5 at the Affoula Israeli hospital. The army kidnapped him on January 7 2013 despite the fact he suffered from leukemia. He was held at the Al-Affoula hospital after being moved from Majeddo Prison following a sharp deterioration due to the seriousness of his condition, resulting from the lack of adequate and specialized medical treatment. The PCHR said that the army conducted at least 50 invasions into Palestinian communities in the West Bank, and kidnapped 50 Palestinians, including seven children. Among the detainees were some political leaders of the Hamas movement. Several Palestinians were also kidnapped on roadblocks across the West Bank. It added that Israeli Navy boats continued to target Palestinian fishermen in Palestinian territorial waters in the Gaza Strip. 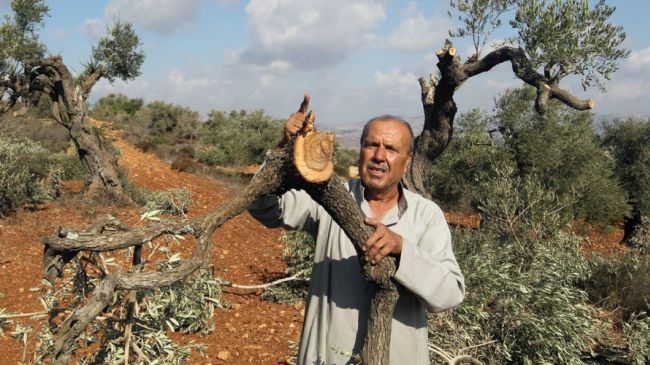 Furthermore, extremist Israeli settlers carried out dozens of attacks against Palestinian villagers and their lands in different parts of the West Bank, cut and uprooted more than 340 trees in Palestinian orchards. Also, at least six Palestinians have been injured as the army continued to use excessive force against nonviolent activists, including Israeli and International activists, protesting Israel’s illegal Annexation Wall and its illegal settlements. One of the wounded is a Palestinian child; three of them were injured in Bil’in weekly protest, one Nabi Saleh weekly protest, near Ramallah, and one child was injured in Qotna village, near Jerusalem. Palestinian Prisoners Society (PPS) said that Israeli authorities issued administrative detention orders against 38 prisoners during October, including two deputies in the Legislative Council. The PPS said in a statement on Wednesday that an Israeli court also extended the detention of 15 prisoners for six months, 12 prisoners for four months, nine prisoners for three months, one prisoner for five months and another prisoner for two months. More than half of Palestinians support a two-state solution, according to a public opinion poll published on Monday. The poll, conducted by the Arab World For Research & Development, covered 1,200 Palestinians in the West Bank and Gaza Strip. 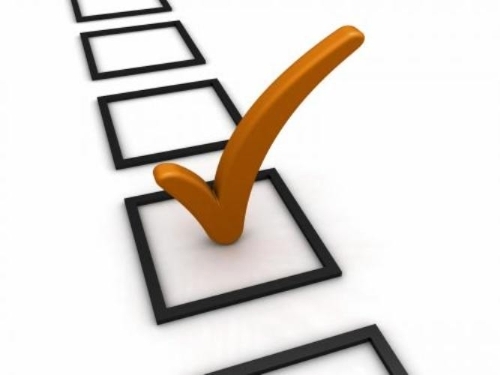 It was conducted between October 20 and 22 and has a margin of error of 3 percentage points. AWRAD describes itself as an independent research center that specializes in political and economic research and development through rigorous policy and applied research. The poll showed that while a majority of Palestinians supports the present round of negotiations with Israel, a similar number of respondents (54 percent) believe the process will not yield positive results. Furthermore, 57% of respondents said they were less hopeful for the peace process than the previous year, while an additional 57% believe that the Palestinians are further away from achieving a state. Nevertheless, a majority of 54% of respondents continue to support the two-state solution, the survey found. Support for the two-state solution is greater in the West Bank (56%) compared to 50% in the Gaza Strip, according to the poll. The poll also showed that 58% of Palestinians support non-violent means "to end the occupation" as opposed to 47% of Gaza respondents who believe that armed resistance is the best method to achieve independence. But while a majority of 60% believe a third intifada is possible in the near future, only 29% said they would support such a development, the poll showed. Israeli occupation forces (IOF) rounded up 390 Palestinians in October including 65 children, a human rights center said on Saturday. The Palestine center for studies said in its monthly report that the IOF soldiers escalated arrest campaigns in lines of the Palestinian people in the past month to foil their joy with the release of the second batch of long-serving prisoners. It pointed out that IOF soldiers launched more than 240 raids into various West Bank cities, towns, and refugee camps in addition to occupied Jerusalem. The center said that the detainees included 65 children, the youngest being an eight-year-old child. The arrests also included two MPs and three young women, it added. In another context, the center pointed to an increase in the Israeli raids on prisons, adding that 13 raids were launched on Palestinian prisoners in October. 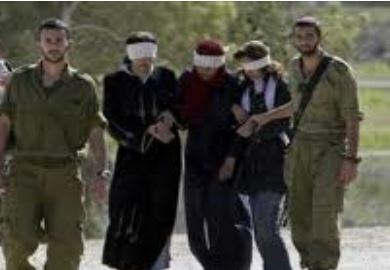 The Ahrar Center for Detainees Studies and Human Rights published its monthly report on Israeli violations against the Palestinians, and said that soldiers killed four Palestinians, injured dozens and kidnapped 325 Palestinians. Ahrar said that the four slain Palestinians have been identified as Younis Radayda, 30, and Mohammad ‘Aasy, 28, from the central West Bank district of Ramallah, in addition to Abdul-Hafith Tayyem, 76, from the northern West Bank district of Qalqilia, and Ahmad Tazaz’a, 22, from Jenin. It added that Israeli soldiers conducted frequent invasions into Palestinian communities in the West Bank, and limited invasions into Gaza, and that dozens of Palestinians have been injured during clashes with invading soldiers. As for arrest campaigns, Ahrar said that Hebron was the most impacted as the soldiers kidnapping 90 Palestinians in October, then 43 in Nablus, 40 in Jerusalem, 33 in Ramallah, 29 in Jerusalem and historic Palestine, 26 in Qalqilia, 24 in Bethlehem, 22 in Jenin, 8 on Jericho and the Jordan Valley, 5 in Tulkarem, 3 in Tubas, and two, including a physically-challenged youth, in Salfit. The Ahrar Center further said that the soldiers kidnapped 17 Palestinian children, below the age of 15, in addition to 17 Palestinians, including two women, who were kidnapped at roadblocks and border terminals. 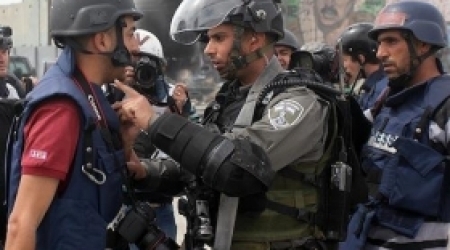 Also among the kidnapped were three Palestinian journalists. Head of the Ahrar Center Fuad Al-khoffash, said that the arrests also targeted a number of political leaders, and two legislators identified as Nazzal Ramadan and Maher Bader. The report was published before an Israeli artillery shell killed, late on Thursday at night, a Palestinian fighter identified as Rabee’ Baraka, 22. The attack took place in Khan Younis, in the southern part of the Gaza Strip.